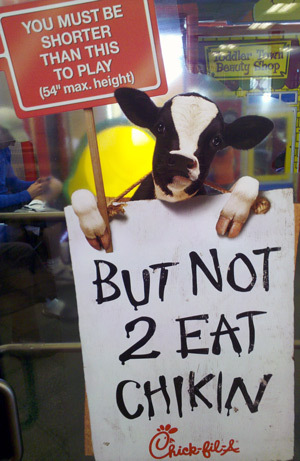 Cows, cows, cows at Chick-Fil-A! 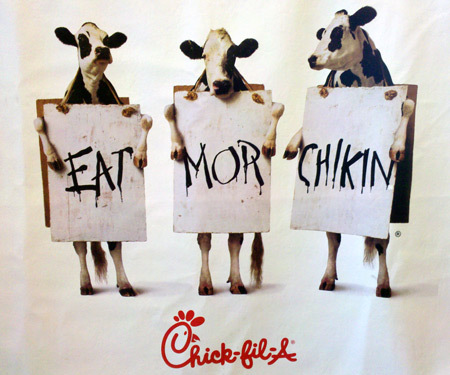 This is Chick-Fil-A’s third appearance on this blog, following the article with the stuffed cow photo, and the cow billboard. This time I’m taking you inside a Chick-fil-A restaurant. 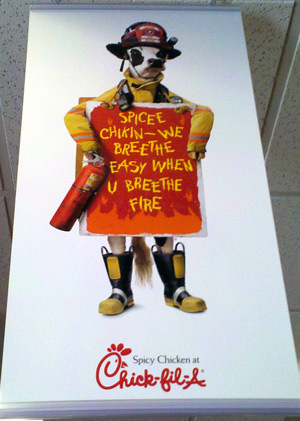 Don’t look for chickens during your visit because there aren’t any. But if you want to see cows, you won’t be disappointed! By the way, did these cows learn to read and write with Hooked on Phonics? Come on, what are they trying to teach our children? Even Charlotte the spider can spell better. Next Post You’ve got to party like a cow!